‘Our Bigger Story: The first chapter’ is a summary report for the first year of Our Bigger Story, which is the multimedia evaluation of Big Local. Over 2015-2016 we have been recording, and training local residents to record, change in 15 Big Local areas across England using films, podcasts and other media as well as interviewing partnership members, volunteers and local residents, and delivery agencies. You can view the Our Bigger Story films on Vimeo, on YouTube, or via the Our Bigger Story website. So what are we finding? It is probably obvious to everyone involved in Big Local that they are all different in some way. This might just be because of where the Big Local areas are: in inner city neighbourhoods, on outer estates, in rural communities or seaside towns. It may be that they are working on different issues to achieve Big Local outcomes; from youth work to projects with older people: from environmental improvements to housing issues. It may be that they are working in different ways to achieve their goals: from the use of small grants, to commissioning services or engaging in long term capital investments in their community. 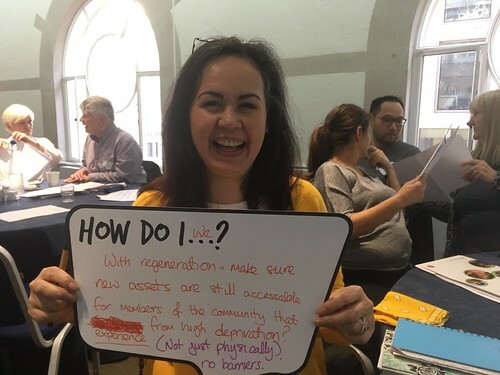 However, from all our work (which has involved talking to over 200 people individually as well as working with local groups) there are some striking similarities in the issues Big Local areas are facing – and in how they work for change. People talk about the difference Big Local has made to them as individuals – through their involvement in partnerships or as volunteers. They talk about the change it has made for local organisations: enabling them to survive, grow or thrive. Most of all they talk about change for their community: a new belief in many areas that change will happen and can be sustained in the long term. It’s an inspiring story – but a challenging one. All Big Local areas believe in resident led change. But it involves a set of balancing acts. Between doing something now to encourage local residents to see achievements and get involved and working more slowly for long term developments. It’s a constant tension between widening community involvement and managing complexity. People are passionate – which is a real plus – but this can lead to conflicts. Partnerships are also very aware that they need to balance doing work at the very local level with making wider connections with other agencies and communities to achieve their desired outcomes. In the coming year we will be looking at how Big Local areas are making that big step.